While the Swash 1200 isn't loaded with as many features as the 1400, it does have several upgrades over its own predecessor, the Swash 900. The new body design moves the power cord to the same side as the water supply connection. Both the water hose and power cord are tucked away in a rear "hidden pocket" so they are less conspicuous and gives the unit a cleaner look. The Swash 1200 has also added user presets, noted at the bottom of the wireless remote control as User 1 and User 2. The presets let two different users save their preferred water temperature, water pressure and nozzle position settings. Another update is the Auto feature. With the push of a single button, the Auto feature provides a 90 second wash followed immediately by a two-minute dry cycle. Many of the updates Brondell has implemented was based directly on feedback from customers. For example, Brondell has added a night light to both the 1200 and 1400 which illuminates from the interior of the bowl with a cool blue light for convenient use without turning on harsh lights at night. Another upgrade based on customer feedback includes a longer front wash nozzle for a more effective feminine wash. 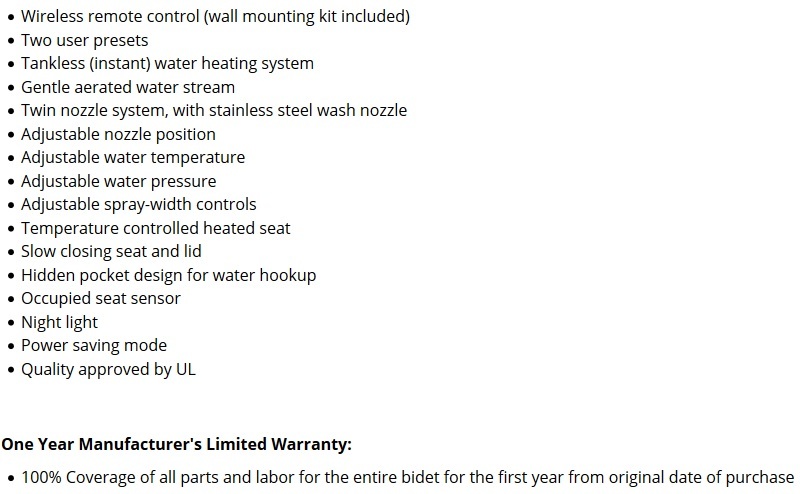 Besides the upgrades mentioned above, the Swash 1200 carries over all the features found on the older Swash 900 such as adjustable water temperature, adjustable water pressure, adjustable nozzle position as well as a heated seat and lid you can sit on. The seat and lid are slow closing so there won't be any loud slamming. The Swash 1200 uses a tankless water heating system for continuous on-demand warm water that won't run out. There is a width adjustment feature to change the wash stream for a more narrow spray or a wider, gentler spray. Plus there is an automatic Eco mode which saves energy when the bidet is not being used. 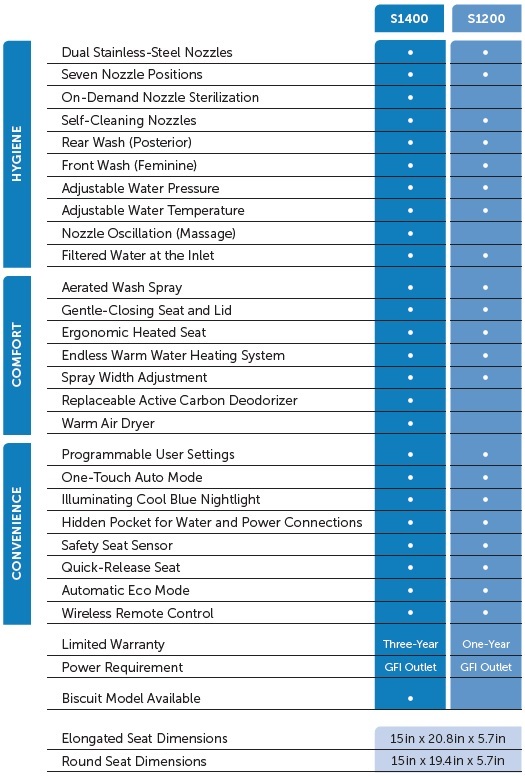 While the Swash 1200 is missing a few key features that the 1400 has - such as oscillating wash, air deodorizer with replaceable carbon cartridges, warm air dryer, and nozzle sterilization - the 1200 is a great entry-level bidet seat at a nice value. This bidet had all the things I was looking for like heated water, warm toilet seat, stainless steel nozzles. Works really well and happy I got it. Great product.